The foliage looks like Geranium, doesn't it, but what is that flower? It's a flower most people wouldn't expect to see in a Zone 5 garden. This is an Opuntia, Prickly Pear Cactus. I was all 'big talk' about how I was going to cut these back earlier this spring. They were spreading and heading into the nearby Geraniums. They are still spreading and mixing in with the Geraniums. - I don't always follow through on what I say I am going to do, even if I proclaim it to the world on my blog. Though I try to do what I say I am going to do if I "proclaim" it. - Not everything is all neat and tidy in my gardens. Far from it. I should have a big weeding class in my garden. I could invite all kinds of new gardeners over and show them the "proper" way to weed and use my own garden as their classroom. It would be a "hoe" lot of fun. - Cactus does grow where it snows and gets cold. Somehow, when experienced gardeners, like I think I might be at this point, post about things not going particularly according to plan or about not following through on cutting back plants at the proper time, it helps new gardeners feel better about their own gardens and gardening efforts. I hope you new gardeners feel better now. Vanillalotus is the lucky winner of the Ethel gardening gloves giveaway. I asked Robin(Bumblebee), who was on Plurk at the same time I was, to choose a number between 1 and 40, and she chose 39. 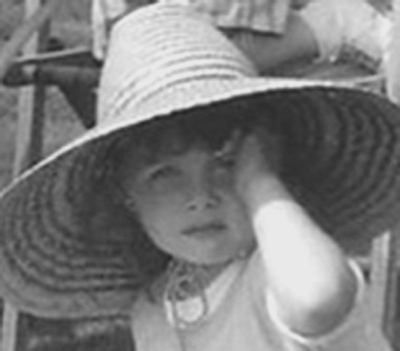 SuburbanGardener, aka Mr. McGregor's Daughter and RedDirtRambling aka Dee were also on that thread so they can vouch for the randomness of the pick. For those who didn't win, you can still get 10% off an order of Ethel Gloves until July 22nd by using the discount code 'Maydreams'. Thank you to all who entered! 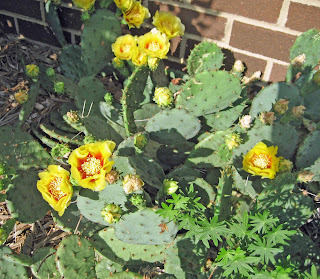 Carol, I hope my little prickly pear blooms soon. I'd take my computer outside to show it yours as inspiration, but I don't have a laptop! I've seen prickly pear as far north as Saskatoon! :) I love how it scrunches up over winter. Hearing that you don't always follow through even makes us seasoned gardeners feel a hoe lot better. Love seeing your cactus blooming. I saw a big pot of this blooming during a garden tour last weekend. Such beautiful blooms. Yes thank you, I DO feel better now. And are you not glad that you didn´t cut back the cactus because I think your plants did a succesful weaving act. Thanks for the shout out. Here's where we differ - I (almost)never announce in advance what I'm going to do because there's a good chance it won't get done. We still haven't pulled out the Yew hedge yet or put up a new fence. 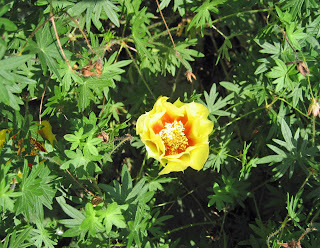 Prickly Pears are so uncommon & Geraniums are everywhere - why not leave the cactus alone? It looks so healthy & happy. Don't you love Opuntia...I'm sure you wear gloves near him. He is prickly! Thanks for the contest, it was fun and th discount is nice. Oh, great! Carol in the middle of Indiana has a blooming prickly pear and Annie in the middle of Texas has cactus that have never made one flower. Glad you left the catus alone. At least you were rewarded for not following through. All I have to show in my garden this year is weeds. I got a good start then got sidetracked. Now there's so many weeds I'd rather go fishing than look at the yard. Now be fair. If you can grow prickly pear in Indiana, we should be able to grow geraniums in Austin. The Garden Fairie, I'd be happy if my prickly pear could encourage yours to bloom. Aren't you north of me? Lisa at Greenbow, These are beautiful blooms but it is a "one week wonder". The blooms don't last all that long so I wouldn't give it a prominent spot in the garden. Marianne, It is a successful co-existence between the two plants, as you point out. Mr. McGregor's Daughter, You haven't pulled out that yew hedge yet? What are you waiting on, LOL? Dee/RedDirtRamblings, Now, wouldn't it be nice if weeding were as fun and easy as plurking? Gail, This prickly pear cactus has already ruined one pair of gloves with its pricklies. I use tongs if I have to pick up a piece of it. Annie in Austin, I am glad I left this combo alone as I wanted some gardeners who think my gardens are neat and uniform, to see that plants do touch each other and look a bit messy. YOUR prickly pear cactus isn't blooming? Wiseacre, it is about that time in the summer when we can tell if we are winning or the weeds are. Lancashire Rose, I don't make up the rules, I just grow the cactus! Nice to see the Opuntia flowers, Carol! I don't have them here because the fog would just make them unhappy, but people do grow them successfully elsewhere in the province. I love your cactus. It's so out of place here in INdiana that it's somewhat of a pleasant surprise when you round that corner of your house.